The CCP system on the LT1 is particularly problematic if removed, either for weight and complexity reduction (which is why i did it) or a standalone engine swap. There are three approaches to dealing with the lack of a functional CCP system, each with their own advantages and disadvantages. This is a no-brainer… and should be done regardless of your solution to avoid the error code. But, if nothing else is done, during CCP duty cycle extra fuel seems to be added, but it seems to trim out fairly easily. This is probably the easiest solution. This is a weird one. You go to raise the CCP enable temperature so the CCP never turns on, and suddenly, BLMs stop working. What the hell do BLMs have to do with a purge canister!? Well, I worked hard to find out, so I’ll tell you, and give you workarounds. Block learn mode operation on the LT1 seems to be (for some kind of programmer’s convenience) tied directly to the CCP duty cycle. 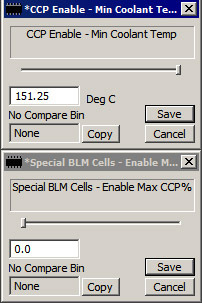 Surely you have noticed that during irregular conditions (stopped idle, decel, etc) the LT1 operates in BLM cells 16, 17, and 18. Well, the condition that must be met for that to happen is actually the lack of ccp actuation, which it just so happens never operates during those conditions. Disabling the CCP by putting the temperature out of range causes you to be stuck in cells 16-18, and block learning becomes useless. The solution is to zero out another constant, which affects how much CCP duty cycle is necessary to enter the ‘normal’ 0-15 cells. Hopefully you’ve been paying enough attention to guess at the result: cells 16-18 are no longer used for anything. This isn’t actually so bad. Idle happens in whatever cell it happens to fall in, and so does decel. LOTS of other GM ecms work this way without problems. But still, play with it and see what you think. Coincidently, this hack is also what you’d want to do if you ran a standalone LT1 with no VSS, so it wouldn’t be stuck in cells 16-18 all of the time.